Cymbidiums are the most common orchids grown in Victoria. 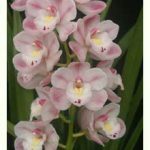 Their popularity is due mainly to the many colourful, long-lived blooms that they produce but also to their ability to grow and flower under a wide range of conditions and to survive a degree of neglect that would kill most other orchids. 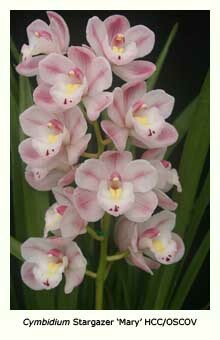 However, some attention to cultural conditions is needed if you hope to grow and flower your cymbidium well. Regular watering and fertilising, effective pest control and, most importantly, exposure to the correct light level throughout the seasons, should lead to success. 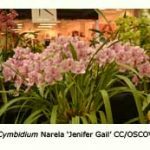 Cymbidiums are best grown in a situation where they receive about half the level of full sunlight for eight or nine months of the year, full sunlight during winter. A shade house covered with shade cloth (nominal shade factor of 50%) is ideal, provided that the house is not overshadowed by nearby trees. Plants will grow almost as well under heavier shade, but they will flower poorly. 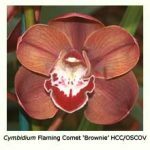 Cymbidiums flower poorly if placed under a tree that casts a heavy shadow – eucalypts are better than most. If possible, place the pots on a raised wire-mesh bench to provide good air circulation and protection from snails and slugs. 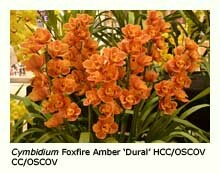 Providing that cymbidiums are grown in an open, free-draining potting mix, they can be watered on every sunny day from October to April. Less water is needed at other times, once weekly being sufficient in mid-winter. Liquid fertilisers can be applied at weekly intervals for most of the year. High-potassium fertilisers, such as Campbell’s A®, are recommended for use between August and the end of December and high-nitrogen fertilisers, such as Aquasol®, at other times. Apply them at one half of the manufacturer’s recommenced concentration, which seems adequate for most orchids. Slow-release fertilisers may also be added in October. 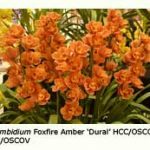 Cymbidiums respond well to re-potting every two to three years, even if they have not outgrown their container, because pine bark potting mixes decompose after that time, becoming acidic and breaking down to finer material, which interferes with free drainage. October, November and March are regarded as the best months in which to re-pot. To avoid placing unnecessary stress on your plants, do not re-pot in very hot weather. Use a plastic pot that is of sufficient size to allow for one or two year’s growth only. 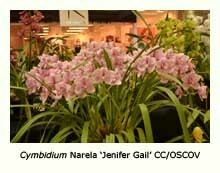 Most orchids, including cymbidiums, do not grow as well if over-potted. First remove the plant from its pot – it may be necessary to cut the pot open with a sharp knife or pair of secateurs if the plant has not been re-potted for many years. Then remove all the old mix and any soft, dark, decaying roots. Always use sterile tools and wash your hands with hot water and soap after handling each orchid to minimise the risk of transferring virus disease from one plant to the next. Re-pot in a commercial pine bark potting mix (5-10 mm particle size). Hold the plant so that the bases of the pseudo-bulbs are 25-50 mm below the rim of the pot and with the other hand fill the pot with mix, working it between the roots. The final level of mix should just cover the lower quarter of the pseudo-bulbs. Add a slow-release fertiliser, such as Osmocote®, (a tablespoonful in a 200 mm-diameter pot is sufficient) and tap the pot until the granules make their way below the surface of the mix.